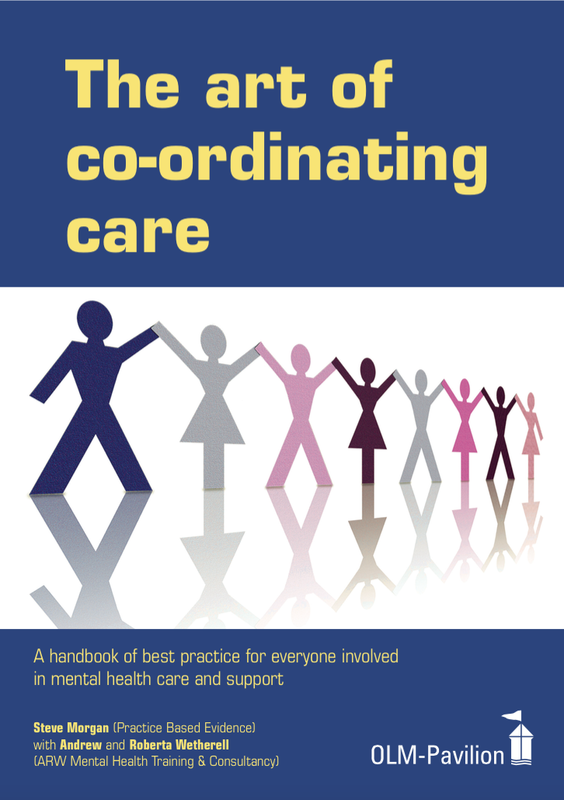 The Art of Co-ordinating Care (2009) is available from Pavilion Publishing & Media. Most people who co-ordinate care do not have the official title of care co-ordinator. Co-ordinating care, at whatever level of complexity you work, should not be seen simply as a static event driven by administrative needs; it is an on-going process in its own right, guided by values and principles that describe what good practice should look like in the delivery of all mental health, social care and learning disability services across all age groups. The mental health system has defined the Care Programme Approach as the mechanism for overseeing the assessment, management and review of people, with a named care co-ordinator allocated the responsibility to ensure this all happens through authority to manage the wider network of care and support. However, this handbook is not exclusively aimed at these workers, but is designed to inform and guide everyone, from the GP or support worker who engage a relationship, observe and communicate important information; through to the more complex tasks of the formalised CPA care co-ordinator. Why shouldn’t practitioners see their work as a creative, passionate and artful activity? Seeing co-ordinating care as an administrative event driven by bureaucratic needs is a personal choice usually carrying negative consequences for the way people feel about their work. We can choose to re-capture the true meaning of why most people came into this type of work; to create a picture, a portrait, a snapshot, a design for positive change, and perhaps above all for enabling hope. We may not see the whole picture at first, rather witnessing the emerging shapes, figures and images of what the service user wants and is able to show. The essential foundation for the work of art will be engaging the relationship. By analogy, its progression may be likened to a dance, but can the service user be encouraged to lead, and the professional be willing to follow? Ideally, the act of co-ordinating care should offer a range of choices, but what can the service users and professionals realistically afford from the menu? The art may also be akin to assembling a cast of characters, but they still need a director to bring the film or play together. The creative process is about making choices available, but the picture must be given time to emerge… we should resist the urge to succumb to painting by numbers; a masterpiece may happen by chance, but more often good quality artistic endeavour grows organically, it is less likely to be produced to order.